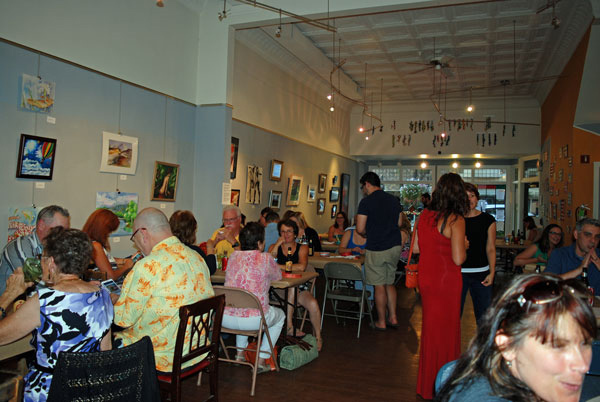 Pottstown, PA – ArtFusion 19464, Pottstown’s non-profit community art center, will be holding its summer fundraiser on Saturday, August 13 from 6:00 – 9:00 pm at the ArtFusion facility. This annual event gets a new twist this year, as the food offering has been expanded to three types of delicious barbeque. Proceeds from this fundraiser are very important to ArtFusion’s upcoming fall programming. Funds raised help to provide free field trips to local schools in conjunction with ArtFusion’s fall educational exhibit. This year’s show is titled Reclaim and will feature artwork created from recycled, upcycled and salvaged materials. The artists have been challenged to reclaim the definition of art, to show that creativity and imagination can expand the view of art as just paint and canvas. Each field trip is tailored to the age of the students and is a fun, interactive learning experience. Students who visit during Reclaim will learn important facts about the environment, recycling and the newest inventions in the fight to tame our trash. They will also have an opportunity to create a piece of recycled art themselves. In keeping with the theme, field trip facilitators will talk with the students about how we can reclaim control over our how we interact with our world and how we affect the health and well-being of our planet. Tickets for the fundraiser are only $25. If the event has not sold out, tickets will be available at the door. Tickets can be bought online at artfusion19464.org, in person at ArtFusion, or over the phone by calling 610-326-2506. Guests can choose a barbeque entrée, or a vegetarian option. Victory Brewing Company has once again generously donated their amazing beer for this event. The Butcher and The BBQ will be expertly crafting the entrees, and Montesano Bros. will again be creating their amazing side salads. The MOSAIC Community Gardens in Pottstown will be donating a fresh salad for everyone to enjoy. There will be soda and water in addition to Victory beer and homemade desserts to finish off the meal. Along with enjoying great food and great beer, guests will have the chance to win fun door prizes. Each guest will receive one door prize chance free with their paid ticket. Additional tickets will be on sale throughout the night. Those who are unable to make the fundraiser can still try their luck by purchasing raffle tickets at the ArtFusion website. Guests could win a $50 Wegman’s gift card, a Bread of the Month gift certificate from Panera Bread, Steel River tickets, tickets for the Reading Fightin Phils, original artwork and special ArtFusion Experiences, where the winner will work with one of ArtFusion’s talented instructors for a one-of-a-kind creative experience. Topics include stained glass, pottery, fused glass and more. ArtFusion 19464 is a 501(c)3 non-profit community art center located at 254 E. High St. in downtown Pottstown. The school offers day, evening and weekend classes to all ages. The goal of these classes is to help students develop their creative skills through self-expression and independence. ArtFusion’s gallery hosts rotating shows featuring local artists. The gallery also sells handcrafted, one-of-a-kind gift items. The gallery is open Tuesday through Friday from 10:00 am – 5:00 pm and Saturday 10:00 am – 3:00 pm. The gallery is closed Sunday and Monday.